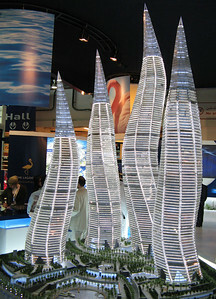 Dubai is a giant theme park under construction. 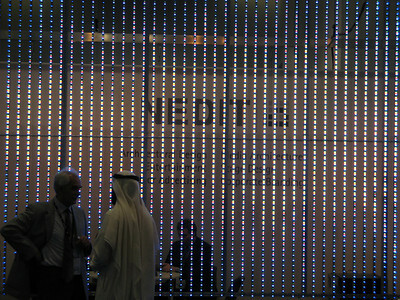 The question lingering on everybody's mind is: Will the bubble burst? 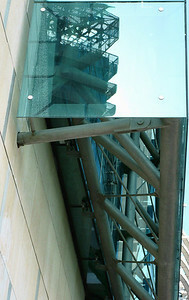 ...... I hope not. 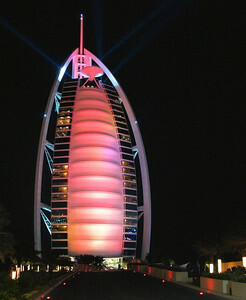 Dubai Old & New: the ultra-modern Burj Al Arab hotel to the left and the more traditional Al Qasr Hotel opposite. 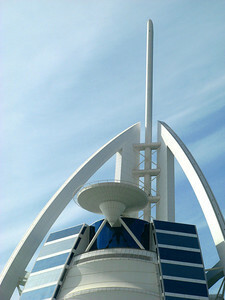 Burj El Arab Dubai ... a spectacular building .... here showing its helipad and spire. 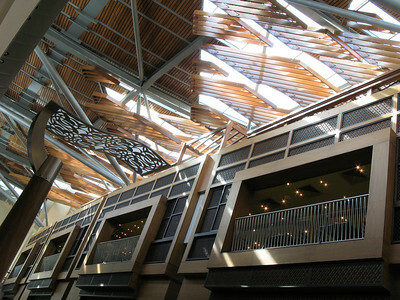 Wafi City Mall. 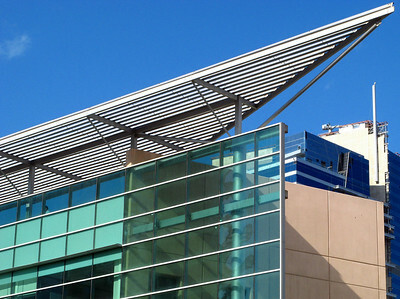 11pm. 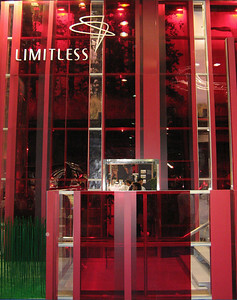 All shops closed. 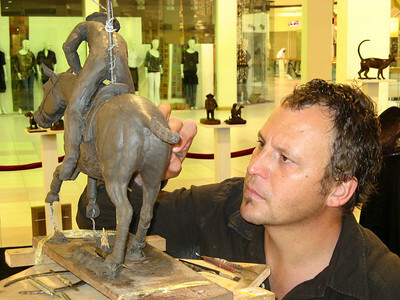 As I was heading out of the mall saw this sculptor on the 1st floor with his assistant still busy at work. 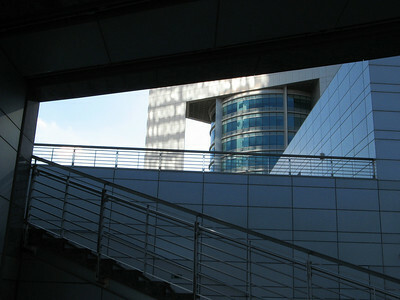 Dubai bank building near the exhibition center. 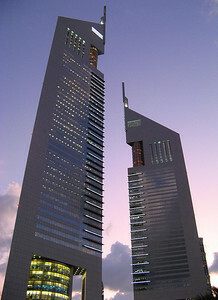 Emirates Tower Dubai .... moments before sunset. 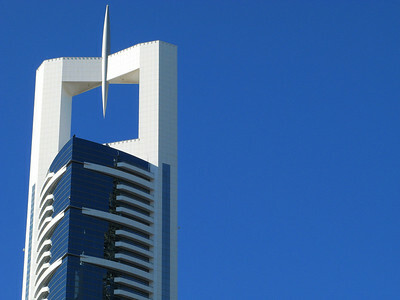 The iconic and highly sculptural form of the Emirates Tower Dubai on a clear mid-afternoon....love the clear blue sky :-) If I say so myself I'm really impressed with my small P&S Canon A710 for producing this result. 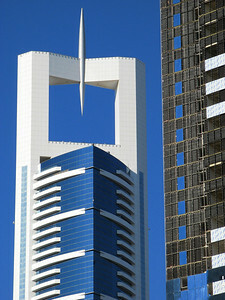 A detail shot of the beautifully conceived and immaculately constructed Emirates Tower podium. 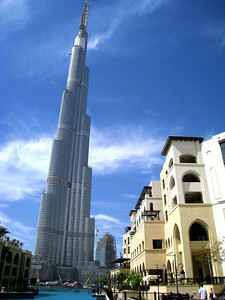 .. owned by the UAE's #1 developer Emaar. 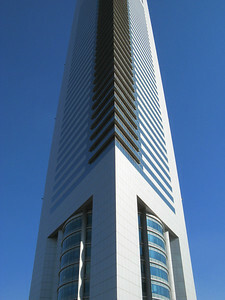 Emirates Tower Dubai on a clear mid-afternoon. 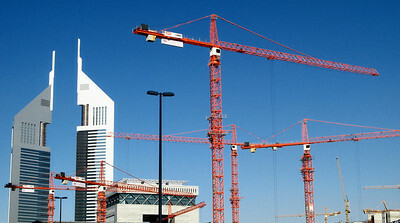 Emirates Tower, Dubai ....as backdrop to the mass of cranes on the adjacent site helping construct the Dubai financial center. 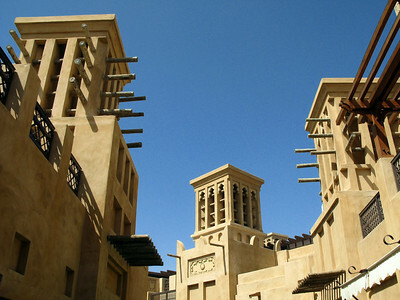 An upward view from a courtyard within the Madinat Jumeirah Souk, Dubai looking at traditional UAE wind towers design. 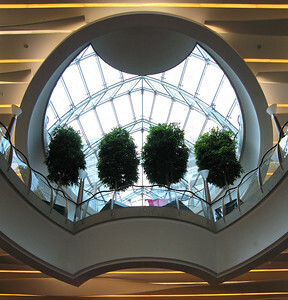 Skylight over main atrium space of the Burjuman Center Mall, Dubai. 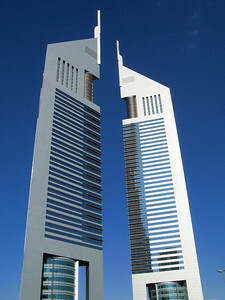 Burjuman Center Mall, Dubai. 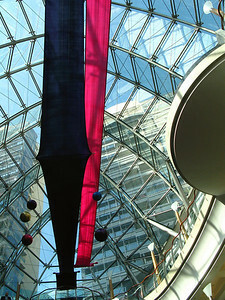 Skylight over one of the main shopping arteries. 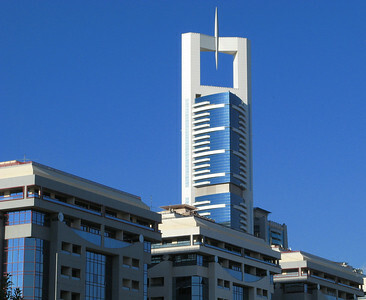 The Chelsea Tower, Dubai ... a taxi driver told me the building belonged to Bill Clinton who named it after his daughter ... 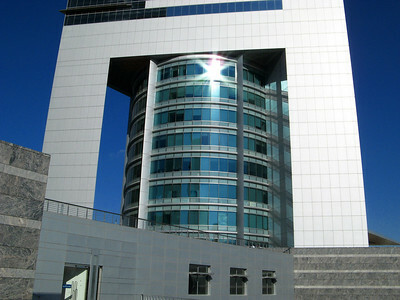 I found that odd and checked the information and found it false! 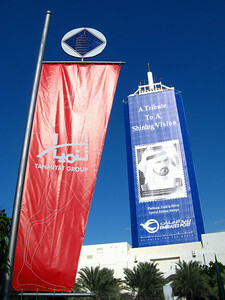 At the 2006 Cityscape Exhibition, Dubai. 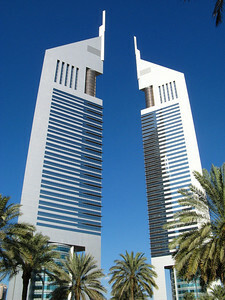 Construction workers from the sub-continent queueing up for buses after work outside the Jumeirah beach Residence, Dubai. 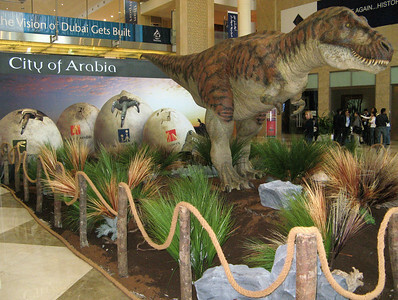 At the 2006 Cityscape Exhibition, Dubai..... who is the marketing genius who decided to associate the 'City of Arabia' with a snarling growling viscious T-Rex? 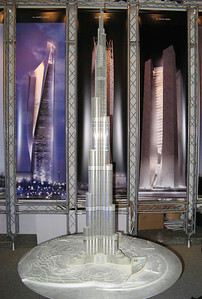 A model of the (currently under construction) 700m tall Burj Dubai in Dubai designed by the legendry American architectural firm SOM. 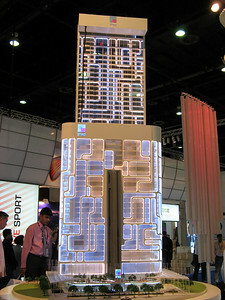 Photo taken at Cityscape 2006, Dubai.